Different kinds of hair extensions are for different reasons. 1. Clip-in hair is easy to use and can be best when it is human in nature. Good looks and hair body can be enhanced by the use of clip-ins. They make the hair look longer and curly or straight according to the desired look. A clip-in extension is painless less time consuming and best fitted and styled at a beauty salon. Although it is advisable to take clip-ins off before sleeping to make them last longer. Clip-in hair extensions are blended to fit with your own hair. Clip-ins can be tedious, but it does help daily change of style and hairdo. 2. Hair weaves are a used to change natural appearance or cover the whole natural hair. Hair weaves can also lengthen; add body or change of color without the damage of chemicals. Weaves can either be sewn-in or glued to the natural hair with the help of a hair dresser. Some of the hair weaves have an advantage that they can be washed and styled as desired, thus making its luster last longer. Hair weaving was taken by a boom by the young generation and the old. One can have braided weave, straight or curly weave according to the desired style. Braided weaves last very long because they can be washed, dried and put back. This type of weave can be relaxing because when it is sown in it only needs hair food daily and a good weave comb. Also at the beauty salon one can ask the hairdresser for some advice on the lotions needed for a weave also on how to cover the head while sleeping. 3. Weft is a weave which can only be glued in. Weaves can either be sewn-in or glued to the natural hair. The glues can be easily washed off using a particular conditioner. 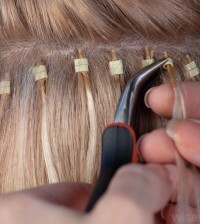 Weft extensions are suitable as short hair extensions because if carefully glued in can cover the whole head. These hairdos can be changed from time to another. Weft is used to show smooth silky soft flowing tangle free hair. Is it the best extension because it is durable, easy to take care of and maintain and most of all it gives a natural look. The wavy weft extensions which are made to perfection, can be easy to maintain with the hair looking wavy without having to process or style it again. 4. Feather extensions are in a variety of colors and lengths which allows one to express him/herself. It is convenient to use feather extensions because they blend in with varieties of hair regardless texture, style or shape. These extensions are fitted in beauty spas and salons. They can be attached to any length of hair and can either blend in or stand out according to ones taste. One can change the way they look by adjusting the size or changing the color. The best part is that these extensions can be treated normally including braiding, blow-dry, flat iron or curls. Feather extensions vary in color thus allowing one to match with the daily wear and jewellery. The feather extensions are made with mineral based dyes thus the colors last long. To care for the feathers one need to hold them over steam and watch them flare and then press carefully under low heat. Extensions hair can be tricky but smart if professionally put mostly in an extensions salon.